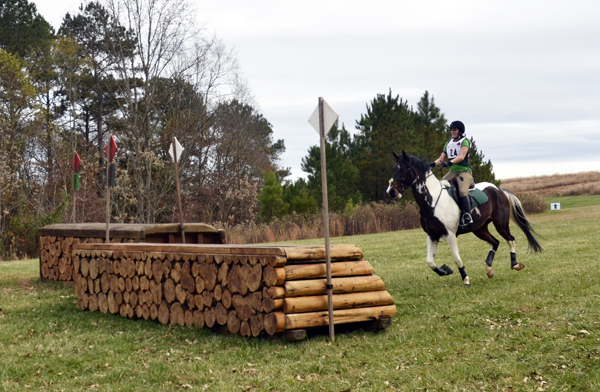 Our cross country outing at the Fork was definitely a breath of fresh air and made me feel like doing the happy dance, but now it’s back to business, and the name of the game is dressage. 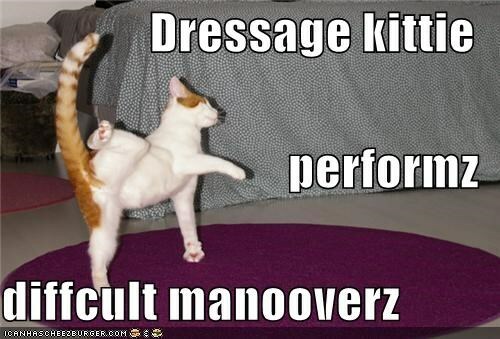 Cat humor + Dressage Meme… you’re welcome. Foster got a well deserved couple days off and last night was our first semi-real ride this week. 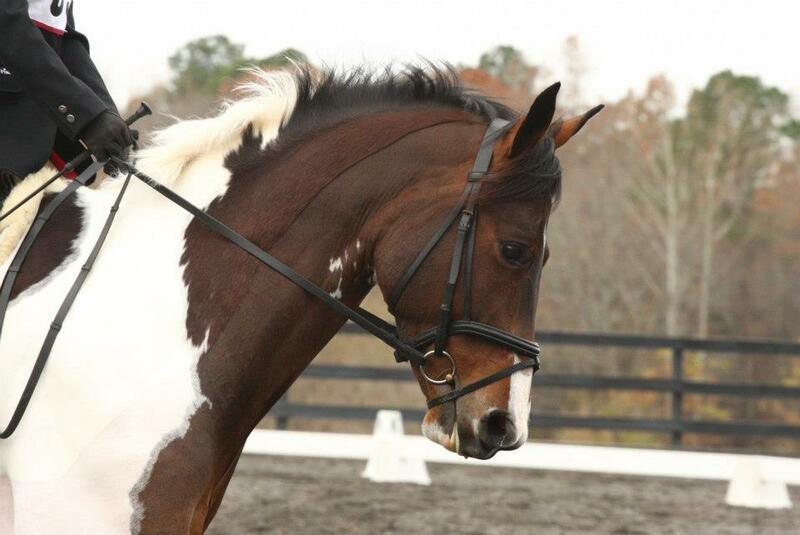 After a discussion with a trainer about his canter transitions, we decided it would be worth trying draw reins to help him understand that he can stay round and engage his hind end to transition rather than rely on his overly developed under-neck. So last night I tried my hand at them. As one who tends to believe that ‘gadgets’ are to be avoided less they become crutches to true training, I have never used draw reins before and it took me several minutes to figure out how to hold them. Needless to say, I now sport a fresh blister on each hand (gloves next time, duh!) but I do see how they will help get the epiphany I am looking for. Foster had two successful transitions where he used his bum, and the groans he emitted definitely reinforced that he is not used to using those muscles! We kept things pretty short so both of us would not be mentally or physically exhausted, but I see a path forward and that makes me hopeful. Tonight we will have another go at it, and Sunday we have a lesson in front of mirrors! Today the high is 66, and on Sunday the high is 38 (that’s the high, we will be riding at 10AM, so I’m guessing it will be 32 or so). Needless to say, if I can stay on it should be interesting! That’s North Carolina weather for you though! And so passed another weekend of going 200 mph. Story of my life. Friday night I hosted a get together for a group of lady friends, Saturday snuck out to the barn briefly to see Foster before going bridesmaid dress shopping and then finished off the night at a gala! 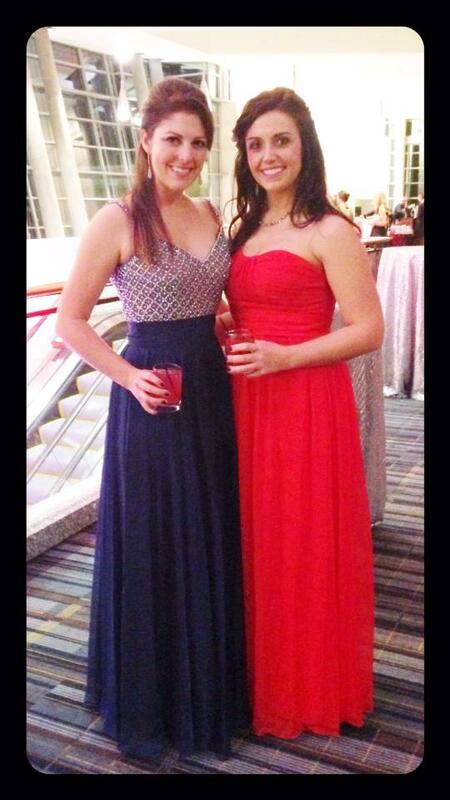 All dressed up for the gala! 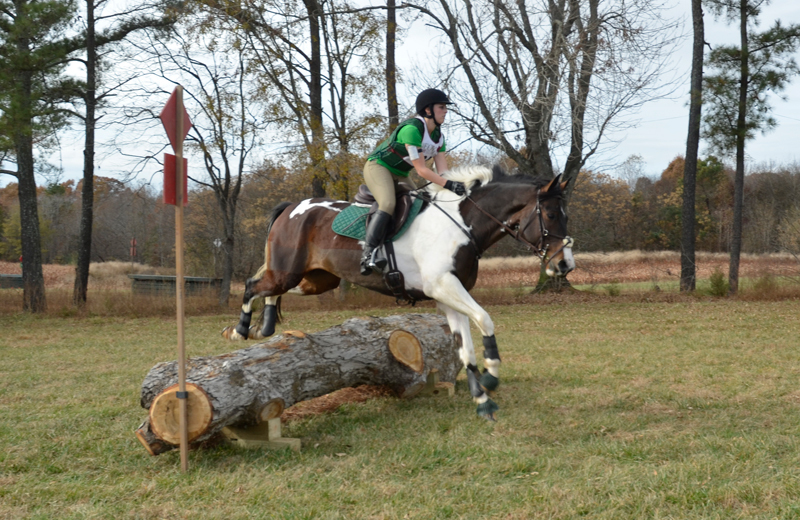 You guys are probably most interested in my cross country schooling yesterday at the Fork though! We arrived shortly after 1 PM, and it was clear that most of the people there were wrapping up and heading home. We got out to the beautiful cross country course to discover we had it all to ourselves- score! 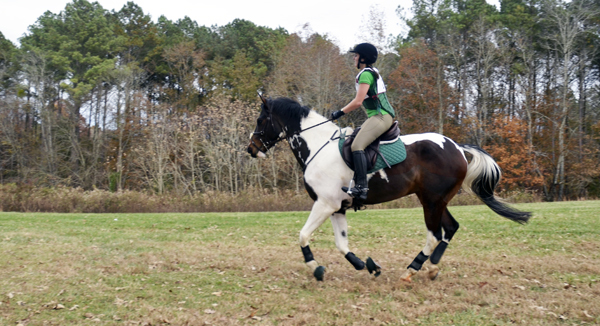 It was decidedly warm yesterday, around 60 degrees, and I was thanking my lucky stars that Foster was trace clipped but still worried he would run out of steam quickly, so we kept warm up pretty minimal. We popped over one Beginner Novice fence and then proceeded to tackle the Novice course one fence at a time. It was apparent that Foster is slightly less confident (as in, not blasé anymore!) to these fences, but grew bolder as we went on, and felt pretty adjustable throughout. We even tackled a few training fences, including a bending line from a max table to a roll top- he was great! The courses at the Fork are always relatively tough, and tend to be maxed out in height and width, and it seemed that this one was no different. The only exceptions were when technical questions were asked- such as a couple combinations and in jumping into water, etc. Overall it was a great learning day with many successes! Julieann conquered her first Prelim fences (badass!) 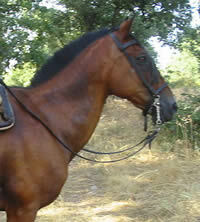 and schooled the training course, and overall Foster showed great competence at the Novice level. We will definitely benefit from more schooling this winter, but this was a great place to start! I should be getting a video sometime tonight, and will be sure to post it so you can see our XC awesomeness! Stay tuned! But let’s start at the beginning- thanks to Ali, Foster was able to get to the show grounds the day before and we had quite a nice schooling in the dressage arena, although I noticed he was getting a bit tense in his neck and starting to go crooked again. During dressage the next day I continued to feel this, but got on with it, since you can’t fix everything in one day. We put in a decent test, with some tension and crookedness but otherwise pleasant enough. I was a bit disappointed that we broke in our free walk (normally a solid 8) but happy that we received a 7 on our right lead canter depart and circle, which has been our pain point in the past couple tests. After discussing with a few equine people much smarter than myself, I am going to get his left hock injected again and hope that solves the crookedness issues that are starting to creep back into our work. In show jumping I did my best to go in with a get-er’-done approach to the first fence, which he went over quite confidently and then move on with the rest of the course. 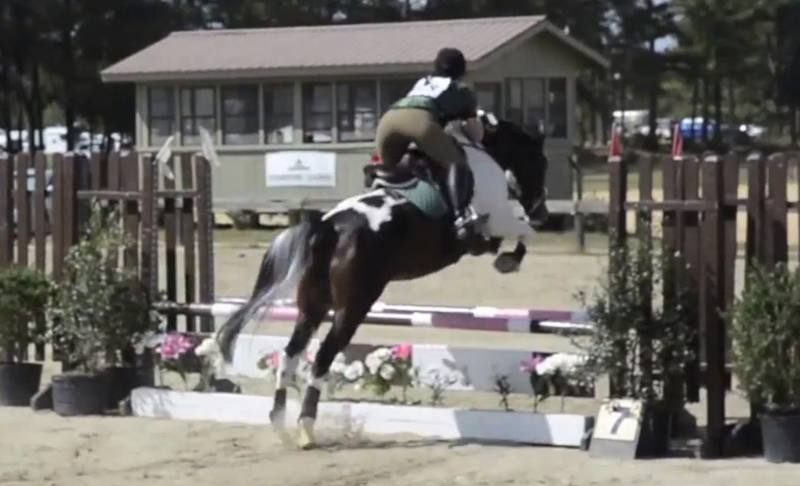 While he almost jumped me out of the tack over fence 3, he put in a nice round and I am oh-so-proud of my spotted pony. I thought the energy was much better than our last show, and was surprised to hear that we received 19 time penalties. 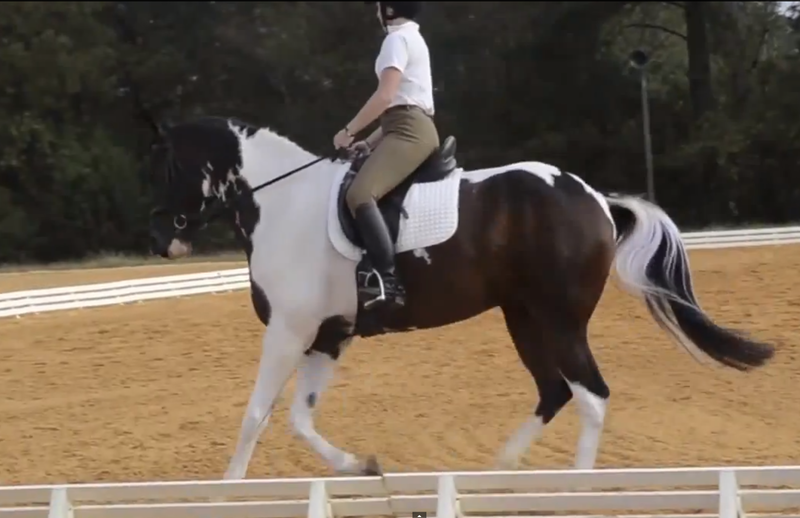 For this level, I thought a forward canter should suffice, barring a few trot strides to allow for simple changes. The time penalty issue seemed to be prevalent for many of the competitors though, so I don’t count it as a loss. Whee! Foster thinks he’s ready for 2’11” fences! Cross country is where things fell apart a bit. Foster was a total star and went over the first fence quite happily, and I had the most fun on cross country that I have had in a long time, cantering all the fences without hesitation. Maybe I was having a bit too much fun even, because when I landed from fence 9 I started looking for 10 and didn’t see it where I thought it would be! In the 30ish seconds that followed, I brought him back to a walk, and then a trot, wandering around looking for what I thought would be an obvious obstacle in the middle of the woods- it was bright orange for Pete’s sake! In any case, I laughed it off when I spotted it, hopped over it and carried on our merry way! Just a minor pilot error, and one that I will be laughing about for a long time! So while we didn’t finish where we wanted to (a whopping 40+ time penalties will do that I guess!) I am so pleased that Foster put in nice jumping rounds and did his best. I desperately needed a positive experience after being so bummed about the last show, and this competition was just that. Still more to work on, I know, but nonetheless proud of my boy for redeeming himself and not being phased by his passenger’s nonsense from time to time! On a more serious note, I have several family members who could do with prayers and positive thoughts sent their way. As great as horses are, our loved ones come first! So if you are reading this and have a moment, please send a quick prayer our way. Thanks for your support! Foster had officially made a full turnaround from the days of rushing crossrails. Tonight’s goal was to do related lines without getting disorganized, and canter the entire course successfully. Check and check! Need more work on my position, but I’m very glad with where we’re at! Novice here we come!